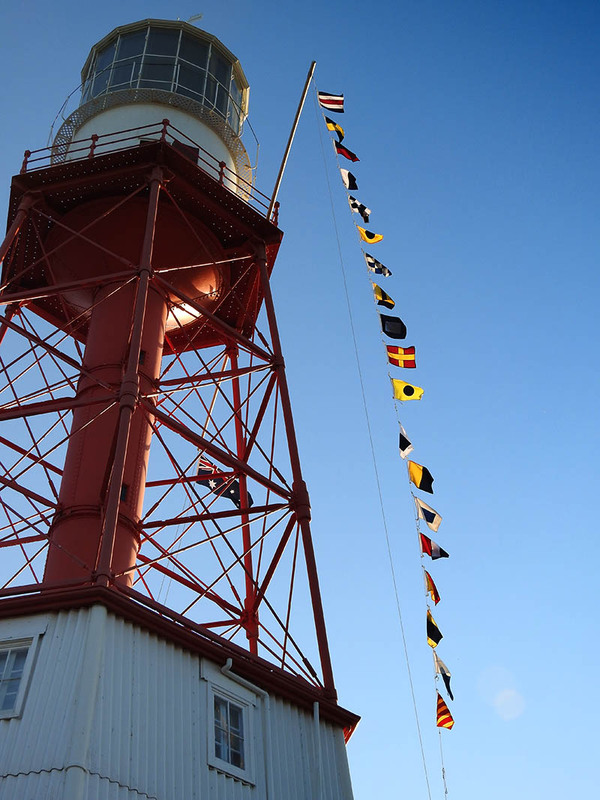 It’s All in the Flags – Cape Jaffa | Lighthouses of Australia Inc. The flags spell out “Cleaning Prisms Today” and on October 5 2018 it was an exciting day for the volunteer custodians of Cape Jaffa lighthouse. The 1st order lens that had not been cleaned for over 10 years was receiving some tender loving care. 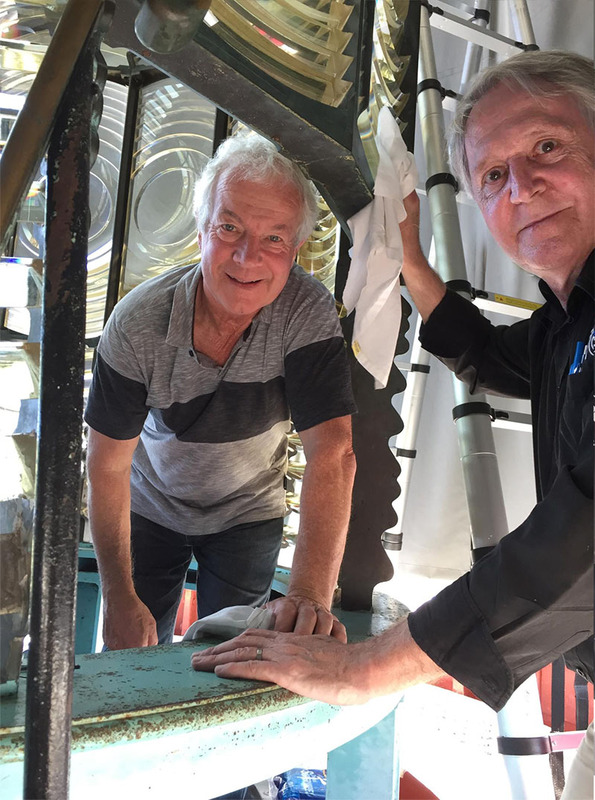 In its working life, when the lighthouse stood on Margaret Brock Reef, cleaning the lens would have been a daily chore – a quick dust before lighting and a good clean each week. That was with fit keepers who could comfortably work at heights of more than 30 metres. 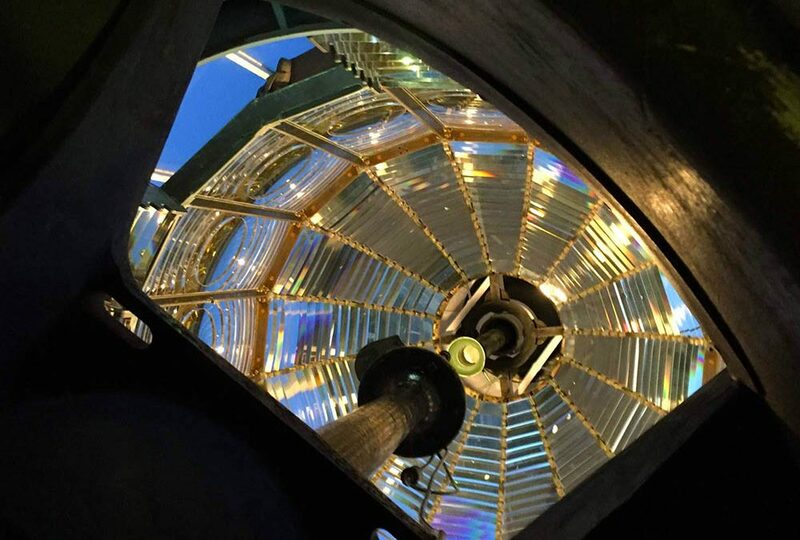 Alison Stillwell, one of the dedicated guides at the lighthouse decided that a clean was well overdue and made contact with LoA seeking guidance as to how best to clean the lens. What is the lens worth? well most would suggest a minimum of a few million dollars – essentially un-replaceable, so it is a task most would face with a little trepidation, so in the course of discussions we were asked if we would like to do the job. Now i am not one of those who works easily at 30 metres. (is it really 30 metres when you’re inside, or only when outside? well to me there is no difference) so fortunately Ian Clifford offered to take the trip and head up the job. Ian has re-lit several of the heritage lights and that includes ensuring the lenses are clean. So the deal was that Ian would do the high work, I would do the lower work. I got the best part of that deal. It is a privilege to care for our heritage but by about the third trip down and up the tower, at 180 steps each trip, to replace dirty buckets of water the novelty was wearing off, but it was still a privilege and satisfying to see each gleaming prism. My count is 16 panels – 655 prisms – 1935 surfaces and after a full 9 hours work, it was lovely to step back and see the lens lit up and the enjoyment it will give. Many thanks to the team of volunteers who treated us like royalty over the weekend. It was very humbling.